Fire Districts 17, 16, Lake Harmony Ambulance, and Lehighton ALS were dispatched to a reported MVA on Interstate 80 at the 281.1 West mile marker. The vehicle was down the embankment perched on top of a large rock. At the direction of EMS Command, crews from rescue 17 and Albrightsville were instructed to remove the roof of the vehicle for patient access. 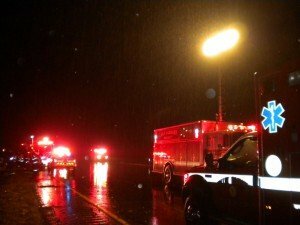 An Air Medical Helicopter was dispatched as well, but was unable to fly due to weather conditions. Once the patient was removed, they were carried up the embankment using a stokes basket and were transported to the local trauma center. Units were on scene for around 1 1/2 hours.